Since the recent release of Yes’s dullest record to date, Heaven and Earth, I was inspired to make a shortlist of my favourite Yes albums in order of preference. 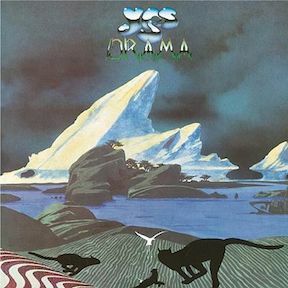 This is extremely hard, as every Yes album has something to love about it and many fans are still firmly in the “if Jon Anderson isn’t in it, then it’s not Yes” camp, which is a rather restrictive viewpoint given members have changed constantly … except for Chris Squire. 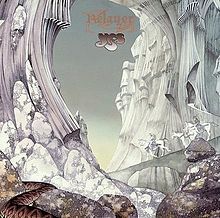 That being said, I still feel like a new Yes fan, even though I’ve been listening to them for 30 years. But in the Anderson spirit of accepting life and all within it, I flew to an undisclosed desert, drew the list in the sand of the ancient Zaaark, returned by camel to capture my thoughts and record two hours of fart sounds on a Hammond. Album forthcoming. Although slightly bloated in places (like the previous Tales from Topographic Oceans), there are many excellent points in its favour. 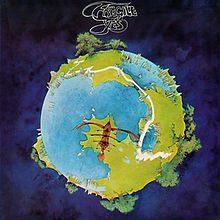 For instance, I love Steve Howe’s lightning guitar work on this, especially during the opening of “Gates of Delirium“. The ‘concrete-music’ elements (the ‘Battle’ section) send it into prog excess overdrive, but that’s kind of the fun of it. The band is in top form instrumentally, and I still get shivers during the ending of “Soon“. “Sound Chaser” encapsulates everything I love about seventies Yes in one song: a killer rhythm section, complex melodies and harmonies, a song that would amaze the ears of a young drummer about what a band could do. SO. MANY. NOTES. I had just discovered Yes’s catalogue in the early-mid eighties; if I recall, I went from 90125 straight into this, which was a mindblower. I also made a point of trying to collect all the solo albums that were released at this time (didn’t get them all but became a fan of Patrick Moraz). There’s already so much written about this album — there is a reason it’s so beloved. Beautifully constructed with classically rich themes, it’s a full-band effort that has so many layers to appreciate. Something new to love each time I listen to it, although it is extremely serious in tone and lacks a bit of fun (even the tuning intro of “And You And I” feels too deliberate), which is the reason it’s not ranked higher. My introduction to the band in 1983; since videos were a brand new art form, I used to stay up late on Fridays just to watch Friday Night Videos. They played the full version of “Owner of A Lonely Heart” (a song that I had been hearing on radio and in stores lately), and I hadn’t been so disturbed by a video since Peter Gabriel’s “Shock the Monkey”. I loved the song and soon bought the full album and immersed myself in anything to be released around it. I didn’t know that I wasn’t supposed to like this new Rabin-infused Yes. I didn’t know how different the band’s sound had become, and how this Eye-on-the-Charts Yes were selling out. I picked up on their trademark knack for melody, a great rhythm section (“City of Love” is still one of the best two-note riffs ever) and I would thank Rabin for giving the band the shot in the arm it really needed (just like Trevor Horn did in 1980). However, this would backfire later for Big Generator, as Yes were trying to please their own fanbase while keeping the newfound pop audience, resulting in a big mess that pleased nobody (although that didn’t stop me from buying the 12” dance remix of “Rhythm of Love”. Oi). But 90125 has it all: light polyrhythms (“Changes”), fantastic vocal work (“Leave It)”, blazing instrumental work (“Cinema“), and as a pop record, nothing else sounded like it in 1983. Trevor Horn’s production literally sparkles, smacks and springs from the speakers. I’ve heard the multi-tracks for “Owner”, and broken down, each instrument is extremely economical and not at all special … but together it’s a work of genius. Too easy a pick perhaps? Maybe so, but it’s the best of the Bruford-included albums for me (I am a drummer, after all). Fantastic classic Yessongs like “Roundabout“, “Long Distance Runaround”, along with little solo contributions by the members. Normally, I would think this would take away from the overall group effort, but instead it lets in a welcomed sense of play, keeping the listening experience surprising and varied. I am expecting the Steven Wilson 5.1 remix of this album very, very soon, and eagerly looking forward to it. What!? An album WITHOUT Jon Anderson but with Trevor Horn and Geoff Downes? What this album has, especially over the previous Tormato (worst cover!) is bite. This really rocks. It’s almost metal in parts (“Machine Messiah”), and Chris and Alan really gel on tracks like “Does it Really Happen?” and the previous “Tempus Fugit”. For myself, Trevor handles the vocals extremely well, although the complex harmonies that Jon obviously had a big hand in are not as present, but neither are the cosmic lyrics (YMMV). And sure, Downes is no Wakeman, but this sounds like a band again … not just a collective of egos itching for a space to throw in an amazing lick. They groove in all the right places (Yes! Grooving! ), and Alan’s drumming hasn’t sounded this powerful probably since Relayer. 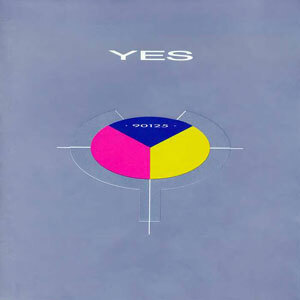 It is the only Yes album that I can listen to throughout and not be tempted to skip anything. Even the sequence of the tracks is masterful: it kicks down the door at the start and doesn’t let up for the whole album, right into the glorious ending of “Tempus Fugit” (I know I keep mentioning it, but it’s probably my fave Yes song). So I finally read the whole article and it makes more sense when you take it from Lee’s perspective. He’s a drummer who pays more attention to the rhythm section than the harmony and melody sections of the band. When you look at it that way, Drama would definitely be #1. Alan and Chris have stated that they felt that was the best they’ve ever played together. In fact they went and did a couple of tracks outside of Yes because they enjoyed their rhythm work at that time. I am surprised that in talking about CTTE he doesn’t single out Siberian Khatru. Bill Bruford has stated that is one of his favorite Yes pieces ever: it’s extremely well written from a rhythm perspective, and structurally unfolds in a very logical way. Combine that with not being ‘expensive’ from a composition standpoint, and it’s easy to see why it’s on the list. 90125 and Fragile are the outliers in the list, but they define the polar opposite ends of popularity for the band. Fragile is probably the core Yes-fans favorite album, while 90125 is the general public’s most popular / widest impression. Good stuff. You make a lot of sense. I don’t much like Fragile myself. I like Close to the Edge, Relayer and Going for the One. Anyway, I’m glad this article was written, because it would never have been written by me; I lack the passion for Yes’s music that the rest of you guys have! There’s just something I subconsciously listen for in rock music that Yes seems not to have, but I can’t quite isolate it. However, I recognize that it’s great music! So, I think I know what you mean about something missing from the group. They are individually regarded as exceptionally skilled / gifted musicians, but sometimes combining them doesn’t quite meet expectations. There is just something that doesn’t quite come together, even when the individuals are performing at the peak. Personally, most bands of this era are better heard live. The more interactive the performance the better the overall ensemble is.. I agree… I have the Yessongs DVD and it’s pretty spectacular. On exactly the same note, I feel the same about Gentle Giant. Recordings can be wanky, but watching them live is breathtaking. Hands down, the most awe-inspiring group performance I’ve witnessed. On screen only, of course, alas. Hey – thanks for your thoughtful response (and not just calling it crap!) as I’m not on FB. I just made the connection to your username (yes, took a while)! I guess the drummer perspective makes sense that I lean towards Drama.. it’s the album I would practice along to the most. Relayer is massive – I could never play along with it because it’s just so dense. It became too hard to memorize, so I spent less time with it than others. I guess the “battle” section makes me snark a little, because it reminds me of ELP’s Tarkus. That also being said, I grew up on a pretty strict musical diet of pop music until I discovered prog rock in the 80s, so I do love melody, which is why 90125 rates so high. I still listened to a lot of pop music up until around 1992 – it’s a bit like my least fave Rush albums all happen around 1989, when they started getting heavier riffs again, and eschewed the poppier melodies of HYF and PW. 5) Drama. Not a bad album. When it was released, I wasn’t sure about the Trevor Horn production, and I found some of the lyrics quite disconcertingly accessible. The fabulous Buggle boys did seem to integrate well with the rest of the band. My favourite on here is Into the Lens with the vocoded singing. I seem to remember enjoying the live date. 4) 90125. This was a much better album than Drama in my opinion. I thought Mr. Rabin did a good job on here, re-invigourating a band which I thought had passed their sell-by date, in much the same way as Genesis. For some reason, I thought side one was much stronger than side 2, containing three standout tracks. 3) Fragile. This is one of only three Yes albums that I can listen to all the way through without losing interest before reaching the end. I think I liked all of the “group” tracks on here and the solo/showcase pieces are enjoyable too. 2) Close to the Edge. Only three tracks, and this album may have been largely responsible for the later Punk backlash, but what a set of tracks. The boys could really put a tune together when they put their minds to it. There were so many memorable moments on here. Bruford left after this album, and I think some of my enthusiasm for the band followed him out of the door. 1) Going for the One. I feel a little guilty admitting this, but I think this album is their best. Some of the writing is fabulous. Listen to the gorgeous “Turn of the Century” and the exquisitely paced “Awaken”. Parallels seems like a reworking of Khatru, but a very good one, and Wonderous Stories is an extremely well-written single with some great synth-work by Wakeman. The title track ain’t too shabby either. (And) You and I are basically on the same page- I love Going for the One. I really need to check out 90125 in detail. I don’t mind a bit of classy eighties pop. If you want to, I’m totally up for it. I’ll be curious, alas possibly somewhat morbidly. 🙂 I’ve always agreed with Rick Wakeman that TFTO was weakest Yes album (although he has stated his opinion in stronger terms). 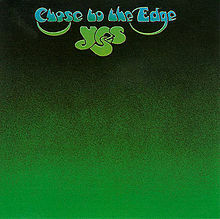 IMO: The Yes Album, Fragile and Close To The Edge are the core releases from Yes. Relayer and Going For The One were the strongest releases after the core. The dark-horses of their oeuvre Open Your Eyes and Keys To Ascension Studio Tracks. There used to be a prog parody/humour site called The Glitzy Cape, inspired by Wakeman.